Hope you all had a great pongal. 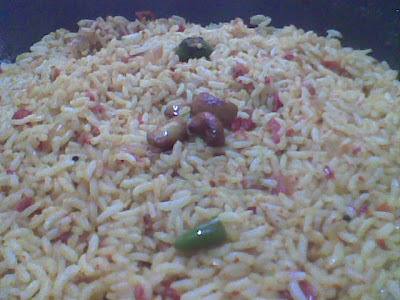 Usually we make mixed rice varieties on the Kannum pongal and have them during the outings. 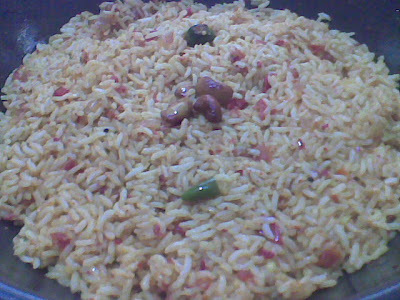 This time I tried a different way of doing the usually made tomato rice. Usually I make it by extracting puree from the tomatoes that of course takes some time. The kids were in home and wanted something different and spicier from the usual which gave way to this. Cook the rice. Make sure that it’s not overcooked or too mushy. Dry roast and grind the list of ingredients under that head and leave aside to cool. Make sure that you don’t burn the fenugreek while roasting as it will give a bitter taste. Chop the onion and tomatoes finely. Slit the green chilli. Heat the oil and temper mustard seeds and urad dal. Add the chana dal, slit green chilli,, cashew nuts and chopped onions and saute for about 2 to 3 mins. Then add the ginger garlic paste, turmeric, hing and the curry leaves. Fry for another minute or two. Add the ground powder (masala) powder and fry for another 3 to 4 minutes. Now add the chopped tomatoes, salt and mix well. Keep the fire on low and cook till the raw smell leaves the mixture. This should take about 10 to 12 mins. Add salt. The oil will begin to separate. Make sure that the mixture is a thick paste and not watery (don’t add water). Once done, mix in the rice, stir well until blended well and serve hot with raita or pickles.